Work hard. Have fun. Get paid. 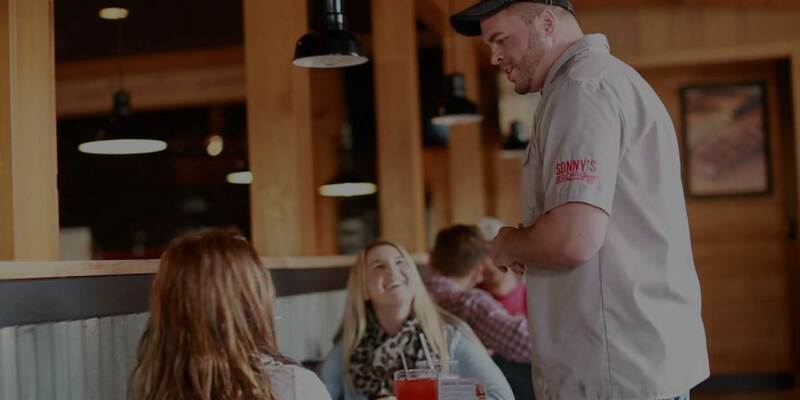 Between the food, the people and the benefits, Sonny’s is a great place to work. Not to mention our commitment to our communities and the fact that we are 50 years strong and still growin’. We have an amazing history and an awesome future ahead that we’d love for you to be a part of. Get Paid to be Saucy. Competitive pay, flexible schedule and a fun work environment. What more could you ask for? With continuous learning opportunities, you can study to become a certified Pitmaster and your cookouts will never be the same. We love promoting from within, so you'll have plenty of opportunity to work your way up to the top. Enjoy great pay, a flexible schedule and workin’ with people who truly care about you and the community. Our Front of House crew provides unforgettable experiences for guests by havin’ a good time servin’ up the best BBQ with a generous helpin’ of Southern hospitality. Our servers don’t just serve. They help make memories that keep our guests cravin’ more. To serve here, you gotta know the basics—great service, pre-bussing, stocking service areas—but most importantly, you gotta create an authentic experience slathered in Southern hospitality. Not all our locations have bars, but for those that do, our bartenders keep the good times flowin’. Whether it’s mixin’ drinks, servin’ food to guests seated at the bar or keepin’ the bar fully stocked with liquor, mixers, beer and other supplies, our bartenders add a little extra pep to the party. The good times in our restaurants start and end with our hosts. Whether it’s greetin’ and seatin’ guests, keepin’ a neat and clean foyer and dining area or invitin’ guests to return as they leave, our hosts make sure guests feel a true Southern-style welcome—friendly, cheery, and comfortable. Cashiers are our go-to guys and gals. 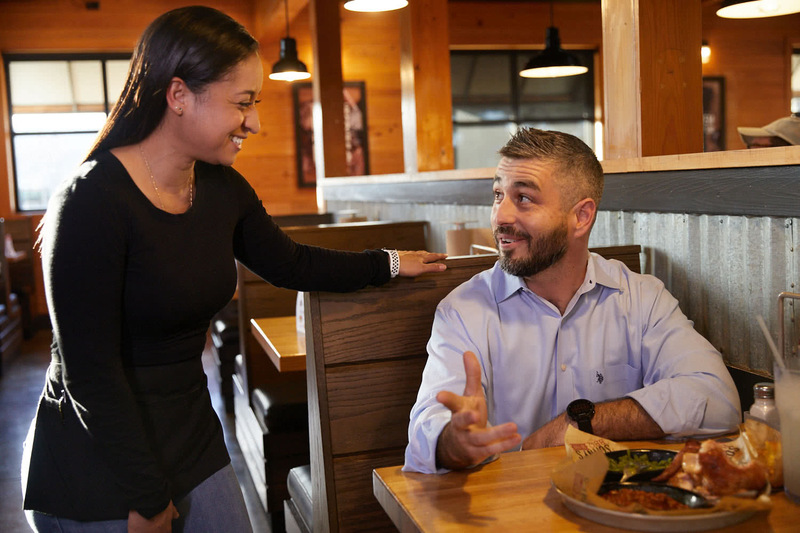 From greetin’ guests at the front register and drive-thru and accounting for transactions to preparin’ and fulfillin’ take-out orders and answerin’ the phone, our cashiers add to the energy of the shift and bring an extra helpin’ of Southern hospitality. Our Back of House crew is the backbone of our restaurants. They’re responsible for preppin’ and cookin’ our food and keepin’ our kitchen clean, safe and running smoothly at all times. Our Prep Cooks are in charge of properly preparing our food. This includes accurately and safely handling, portioning, labeling, dating, rotating and storing all of our food and ingredients to ensure our food lives up to the high standards our guests expect and deserve. Whether it’s preparin’ all food according to our tried and true recipes and plate presentations or makin’ sure we serve the right amount of food with the least amount of waste, our Cooks create the delicious BBQ and fixin’s that keep guest comin’ back for more. Our Salad Bar Superstars make sure our Garden of Eatin’ is fully stocked with the freshest salad fixin’s before and during every shift. This includes cleanin’, peelin’ and slicin’ fresh vegetables and fruits and preparin’ salads so our herbivore friends always have somethin’ to look forward to. Our Dish Machine Operators must properly run a dish machine and follow all safety regulations for sanitation. They also bus, sort, rinse and rack dishes and keep our kitchen stocked with clean dishes at all times. They’re in charge of trash and cleanin’ floors, work areas and restrooms as well.